UNESCO, the UN's educational, cultural and scientific agency, will vote imminently on whether to grant Bethlehem's Church of the Nativity World Heritage status. In 2011 UNESCO controversially admitted the Palestinian Authority (PA) as a full member. The PA, of course, is exploiting membership for political rather than heritage purposes, as well as seeking to delegitimise Israel. Thus PA leader Mahmoud Abbas has forced a vote on Bethlehem's Church of the Nativity, the traditional birthplace of Jesus Christ. Abbas claims the church is under imminent threat of destruction by Israel, which is why it should receive special UN status immediately. But this is nothing at all to do with protecting a Christian holy site and everything to do with nationalist politics, which is why exasperated UNESCO officials who do not believe the church is under threat from Israel have asked Abbas to make his bid for World Heritage status through the normal channels. But Abbas is having none of it. Exploiting a Christian icon for political purposes is too good a chance to miss. Or what about the claims on Fatah television that Jesus was a Palestinian, the first Palestinian martyr, or that the Virgin Mary was of the nation of Palestine? One PA MP has claimed that Jesus was the first Palestinian to be tortured, while a PA newspaper has claimed Christianity was born in an Arab country and Jesus was a Syrian Palestinian. The same newspaper also ran a headline referring to Nazareth as the city where the Jews murdered Jesus, a Palestinian (Jesus, of course, was Jewish). Fatah television has also referred to Jesus as a Palestinian Muslim prophet. Details of these and other PA attempts to cynically exploit Christian symbols for its own political means can be viewed here. But it's not just the PA doing it. 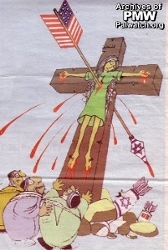 Palestinian liberation theologians also frequently and unashamedly manipulate Christian symbols for nationalist purposes. Which all begs an important question. 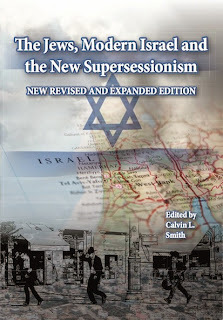 Several well-known Christian anti-Zionists have publicly and repeatedly criticised Christian Zionists, claiming they have repudiated Jesus and preach another gospel. One would therefore reasonably expect them just as vociferously to condemn such cynical Palestinian exploitation of Jesus and Christianity for political purposes. One would also hope they would firmly rebuke proponents of Palestinian liberation theology, together with its weak Christology, among Christians espousing Palestinian nationalism. But somehow I doubt it. This is a pity, because it is only when the Palestinian political classes realise there's a real danger of losing Christian sympathy and support that they will treat Christians and what they hold dear with more respect. 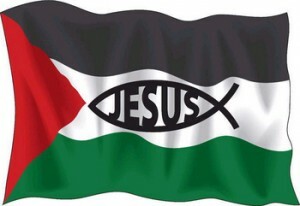 Ultimately the real losers in this sorry saga, of course, are Palestinian Christians who reject both Palestinian liberation theology and cynical Palestinian nationalist exploitation of Christian symbols. It must be unpleasant not only to see what they hold dear trampled upon, but also that it is done in their name. In the meantime exploiting Christianity for political purposes has now moved far beyond PA television and newspapers to the world stage, which is why UNESCO is voting imminently on the Church of the Nativity.